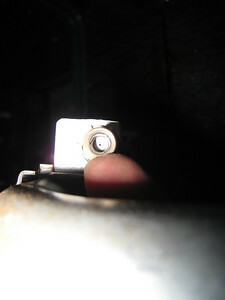 2. a spark lights up the pilot flame when you turn on the oven (called a “spark-assisted pilot”). Today, I’m gonna ‘splain how to replace the thermostat in the first type of pilot ignition oven listed above, the standing pilot ignition. 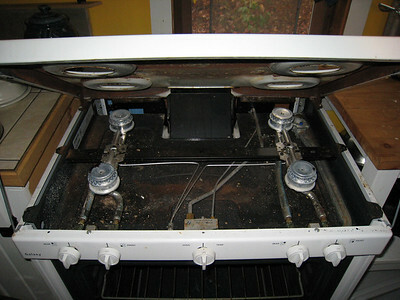 Lots of these old gas ranges are still out there in use today. I actually prefer these ranges to the newfangled electronified junk they’re making these days. The other distinguishing characteristic of this type of range is that it requires zero electricity to operate. No electrical outlet is required because there’s nothing electric on this range. That makes this type of range a popular choice for homes (and camps) which aren’t connected to the power grid. In fact, the pictures in this article were taken during a repair I did for some friends of ours in Vermont who live off-grid. If the pilot flame jumps upwards or just gets bigger, but doesn’t shoot down, then you need to replace the pilot assembly. 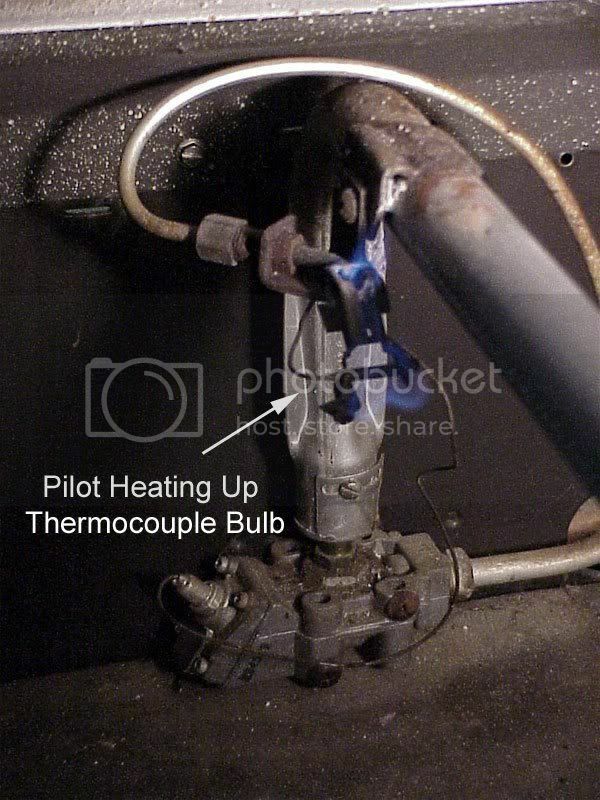 If the pilot flame size does not increase or jump down when turning on the oven thermostat, then the problem is the thermostat not sending enough gas to the pilot assembly. It’s also possible that the pilot gas supply tube has a hole in it somewhere. Now, slowly re-read the pearls above several dozen times and savor them like fine saké. It helps to also burn incense and chant “Fixitnow.com Samurai Appliance Repair Man” at least 100 times while meditating on this arcane wisdom. Once you’re posilootely, absotively certain that the thermostat is the bad actor here, then you may proceed with the pictorial guide that tip-toes you ever-so-gently through the tulips of this repair. And you remember the deal with thumbnail pics, da? That’s right, grasshoppah: you gotta click ’em to see the larger picture with the enlightening annotations. And if you need to buy a new thermostat for your range, type your model number into the parts search box below and you you can buy it right there. It may give you a warm, fuzzy feeling in your navel to know that when you purchase parts through the links at my website and repair forum, it lets me write how-to articles like this one and save you wads of cash on service calls. Domo! 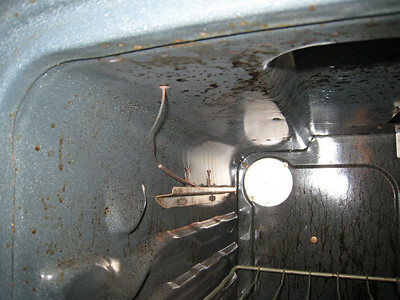 If you don’t know your model number – try searching by appliance type, brand or part type. On this range, the thermostat is located in the middle of the control panel. You can access it by removing the grills and lifting the hood, as shown here. The thermostat temperature sensing bulb is connected to the thermostat via a copper capillary tube. This tube is bonded with the thermostat body at the factory and pressure charged with a gas that expands in response to the temperature. OK, you can uncross your eyes now ‘cuz that’s about as techie as I’m gonna git in the article. The take-away point is that you cannot replace the thermostat separately from the sensing bulb and the new thermostat comes with a factory-fitted sensing bulb. 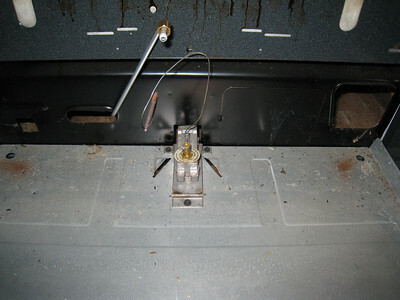 Notice how the thermostat capillary tube is routed through the top of the range and into the oven and the bulb is mounted on the side of the range. You’ll copy this when you install the new one. When working on an electric appliance, the first thing you do is unplug it before disassembling it. 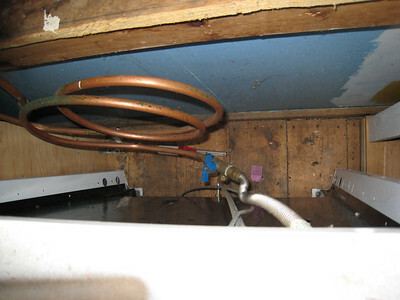 Similarly, when working on a gas appliance, you need to shut off the gas supply before taking it apart. 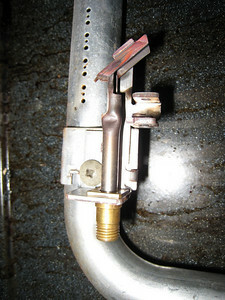 In a properly installed gas range, the shutoff valve is located behind the range, as shown here. Note that the gas supply line here is copper. This is an older installation where this was the norm. Nowadays, the preferred practice is to use steel flex tube. Shown here I’m starting the disassembly. 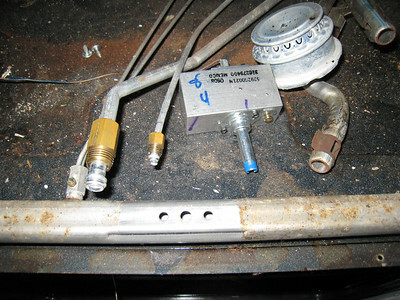 The burners are removed and the two aluminum gas tubes are unscrewed from the back of the thermostat body. To remove the thermostat body from the gas manifold, you’ll need to remove its mounting bolts. 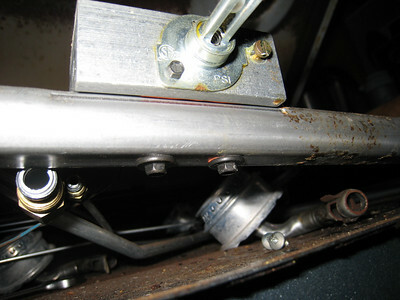 In this case, the mounting bolts are located underneath the thermostat. A piece of gasket material between the thermostat body and the manifold tube creates a gas-tight fit. Remember: any connection that passes gas ( ) must be leak-checked when you’re finished. Here’s the manifold with the old thermostat removed. The gasket material that I mentioned above is stuck to the underside of the old thermostat. The new thermostat kits usually come with a new gasket. That’s about it for the thermostat. While we have this beast torn apart, let’s feast our bloodshot squinties on the gas valve as an enriching excercise. Here it be. Notice that it has its very own capillary tube and bulb. Wassup wit dat, yo? That’s the flame sensing bulb. 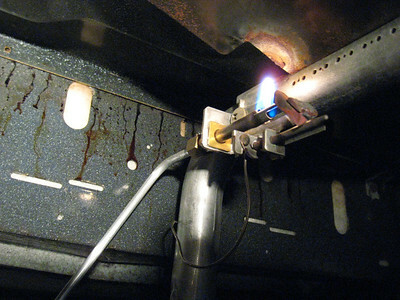 It’s a safety feature that prevents the gas valve from opening (and letting gas through) if there’s no flame present. In other words, that bulb has to sense a flame before the gas valve can open. Does this sound like diagnostically useful information? Ya sure, ya betcha! Tuck that away and ponder it during your next morning constitutional. And here’s a closeup of the pilot assembly itself. This can be another source of problems, as mentioned in my prolegomena comments. On the back side of the pilot assembly is a plug with a small, precision drilled hole in the middle of it. 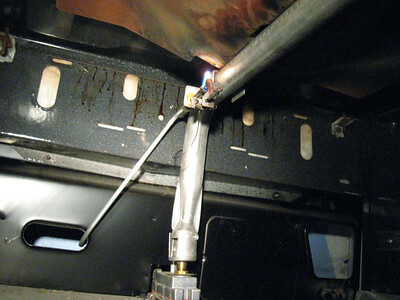 If this hole gets dirty or partially clogged, which it will on occasion, then the pilot flame will not put out enough heat to open the gas valve. If the pilot assembly seems to be in good shape otherwise, you can simply clean out this orifice with isopropyl alcohol and compressed air (about 50 psig will do it). Use an air nozzle with a rubber tip so can get a good seal when you squirt compressed air through it. OTOH, if the pilot assembly looks too boogared up to use any longer, then just replace it. Here’s the pilot assembly reinstalled and re-connected to its gas supply tube. Here I’m checking my work by firing up the oven to make sure it fires the burner tube. This is an exciting action shot showing the pilot assembly in the ready position, just waiting for the oven thermostat to be turned on. Needless to say, we had normal ignition and all systems were go. The Samurai whupped-up on another insolent appliance and restored its design function. Now, go and do likewise. 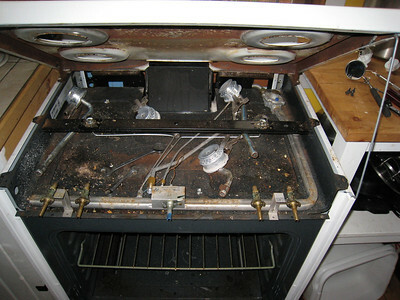 This entry was posted in Oven Repair, Range Repair on August 11, 2008 by Samurai Appliance Repair Man.